Since 1995, without fail, NASA has released a photo of the day every day. Featuring nebulae, the aurora, comets, meteors, planets, moons and galaxies, you can’t help but be amazed by each and every image. Some are instructional, others simply magnificent but with all of them, you’d think the photographers were artists instead of scientists. We’ve looked through all of the 2011 images of the day, and chosen the 10 most awe inspiring that NASA had to offer. Well, almost. There are still a few days left to the year so you might have to rephrase the title of this post to “NASA’s 10 Most Stunning Images from 2011 Minus Four Days.” Enjoy! The Trifid Nebula, discovered by Charles Messier in 1764, is approximately 5,000 light-years away. 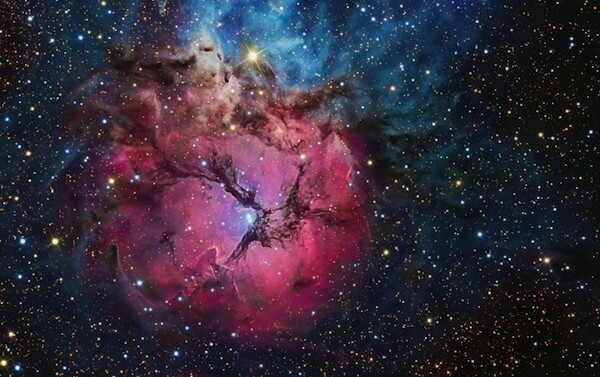 According to NASA, the Trifid has three types of astronomical nebulae (hence the name): emission nebulae, reflection nebulae and dark nebulae. If you wanted to get there, you’d just head toward Sagittarius and smack right into the thing. We have R. Jay GaBany to thank for this magnificent image. Doesn’t it look like a beating heart? 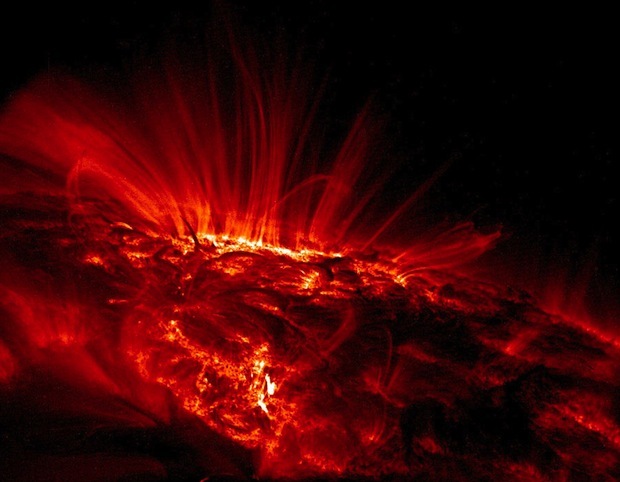 This ultraviolet image of the sun will give you an idea of just how hot it gets out there. While the darker spots are only a few thousand degrees Celcius, the red glowing gas around the sunspots can get to over one million degrees Celcius. Aren’t you glad it’s 93 million miles away? 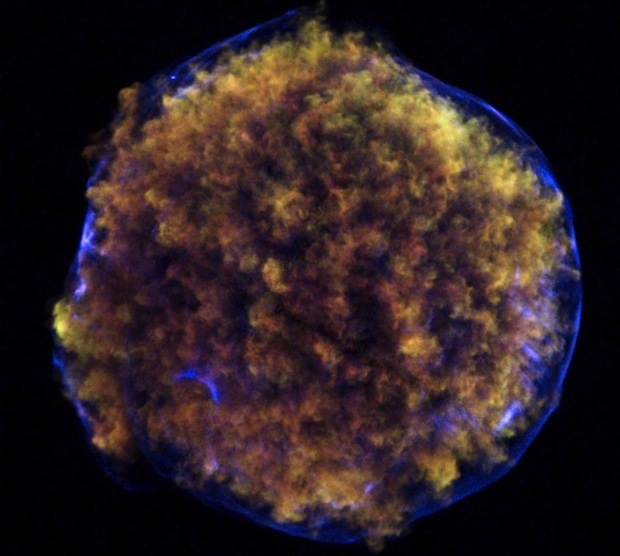 When a star explodes in space, no one is around to clean up the debris. 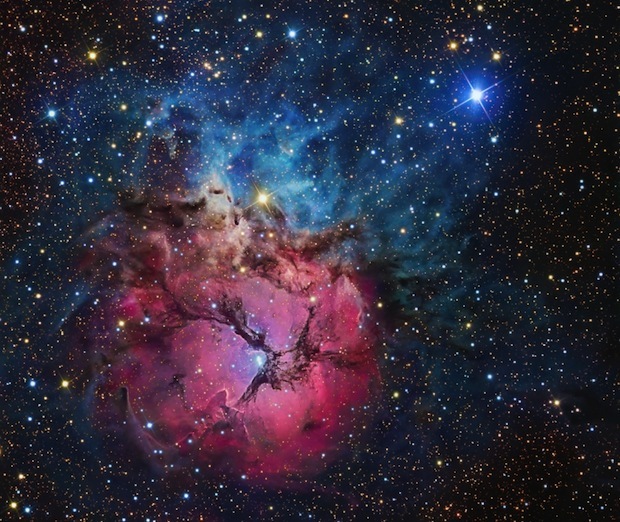 Happily for us, these are some of the most beautiful remnants of a celestial object we’ve ever seen. 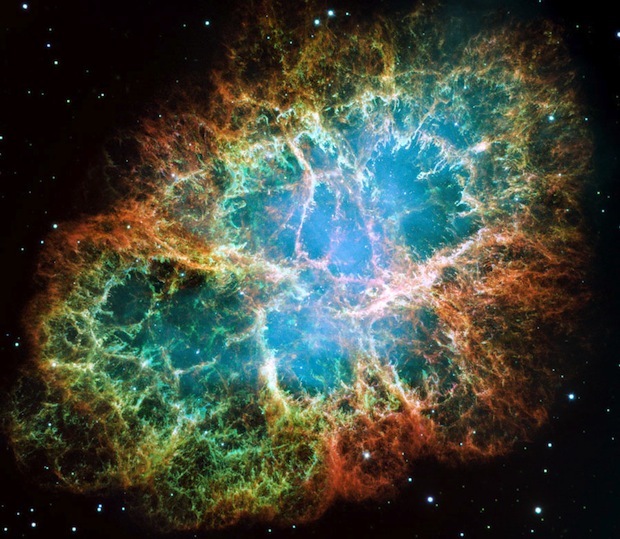 The crab nebula is the result of a supernova that occurred in 1054 AD. This image was taken by the Hubble telescope, and in the center is a pulsar, or a neutron star. Located in the constellation Cassiopei, Tycho is a supernova remnant about 13,000 light-years from our little blue planet. This exploding white dwarf star is one of only a few supernovae that is visible to the naked eye. Tycho has been around since 1572 and was named after Tycho Brahe, although, he certainly wasn’t the first to see the exploding star. Just like here on Earth, the surface of Mars changes with the seasons. 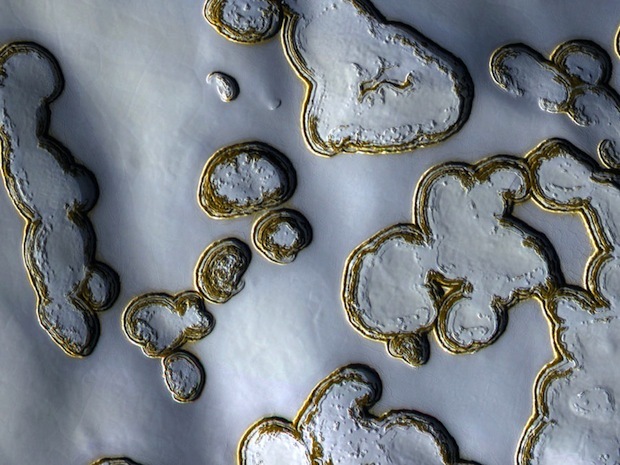 When the Martian summer approaches and warms the planet, the carbon-dioxide ice cap around the south pole start to evaporate leaving these beautiful gold ringed shapes. This image was captured by the Mars Reconnaissance Orbiter in July of this year. While the lines around the ice look like gold, scientists are unsure of the composition of the material. When winter comes back around, more ice will develop. 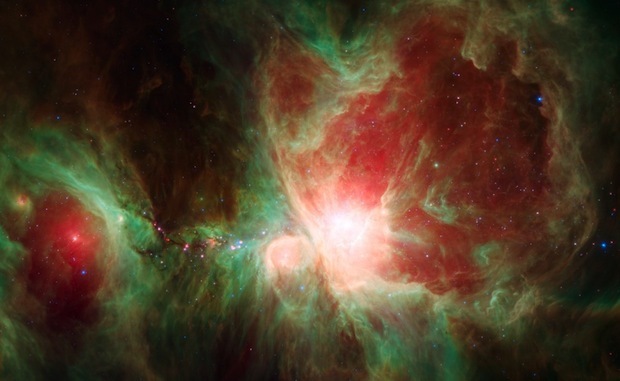 Compared to the other nebulae in this group, Spitzer’s Orion is relatively close. Only 1,500 light-years away, this haunting image was taken with infrared data from the Spitzer Space Telescope. This is what they call an active stellar nursery. It houses thousands of young stars and protostars. The red spots in this image reveal the protostars, which are clouds of interstellar gas and dust that will one day form dense cores and become stars. This time lapse photo titled The World at Night by Babak Tafreshi shows the Quadrantid Meteor Shower above the ruins of the city Damghan in Iran. Two quadrantid meteor streaks (two streaks going in opposite directions to the rest of the star streaks) can be viewed in the top right of the image. One is very strong, and the other is quite faint, but runs parallel and just below the defined meteor. For those in the northern hemisphere who would like to witness the annual Quadrantid Meteor Shower for themselves, wake up early on January 4th if it’s a clear morning, look up and behold. 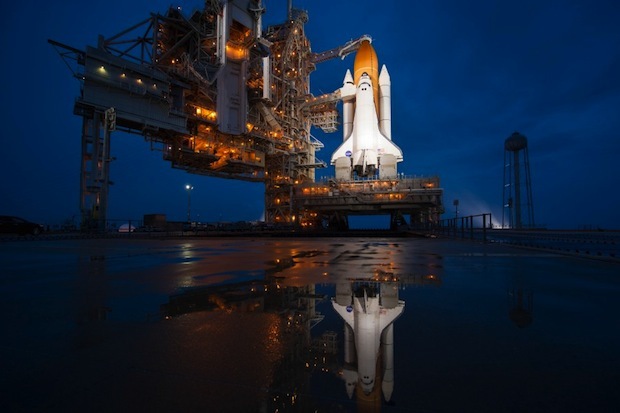 You can’t even talk about stunning images from NASA without mentioning Atlantis, the very last planned shuttle mission in the 30 year long space shuttle program. While Russia will still be sending people into space, the USA has stopped for the foreseeable future. Americans may still go up, but it will be with a 56 million dollar ticket paid to Russia. However, just because we’re not sending shuttles up right now doesn’t mean we’ve stopped exploration. 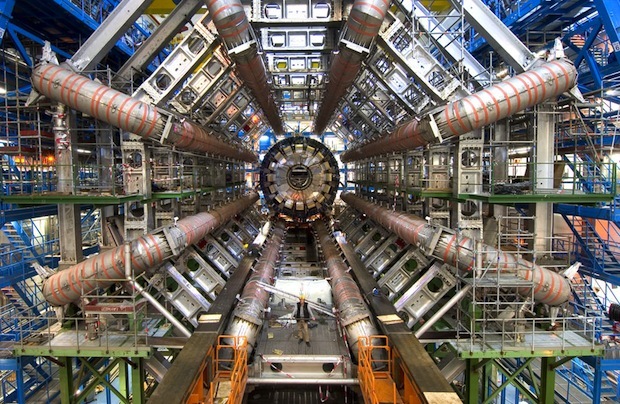 NASA’s programs continue and data gathering devices tell us more about the universe every day. This is just one out of many of what NASA calls a dust pillar. Created in the Eagle Nebula, these tall graceful forms are evaporating shells of gas and dust. Inside of each is a nursery where new stars are being formed. Standing at ten light-years tall, it sends out burning hot radiation. This image was taken by the Hubble Space Telescope in 2005. Really cool pics, thanks for sharing! These also make for interesting design inspiration!